Above: Some picketers during the three-day strike at Hopkins Hospital in April. The 2,000 service workers at Johns Hopkins Hospital agreed today to go back to the bargaining table on Monday, opting not to strike at Baltimore’s largest private hospital at the end of a “cooling-off” period requested by Maryland Gov. Martin O’Malley. 1199SEIU spokesman Jim McNeill confirmed this morning that workers will not be striking this weekend. Instead, the parties will return for a second bargaining session with Hopkins following Gov. O’Malley’s request. During Tuesday’s bargaining session, the parties did not come to an agreement over wage minimums for a new four-year contract, raising the specter that the union would reinstate its threat of a four-day strike as early as today. McNeill said the union has not given Hopkins notice of a future strike date. 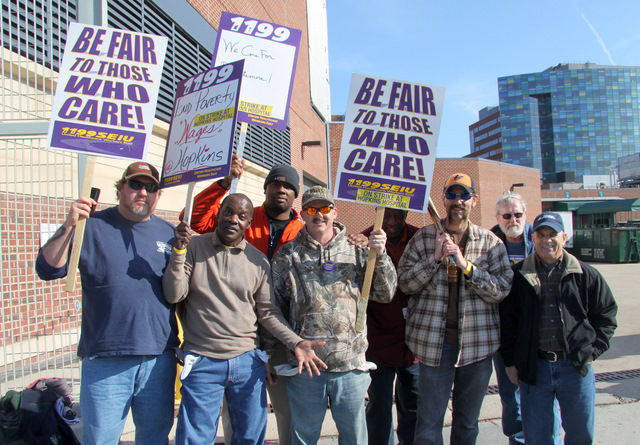 1199SEIU and hospital management have been stalemated since March. A three-day strike in April protested the so-called “poverty wages” paid to janitorial, technical and other non-medical staff.